In patients with prediabetes or type 2 diabetes, the use of thiazides as antihypertensive agents has been challenged because associated metabolic adverse events, including new-onset diabetes. These metabolic disturbances are less marked with low-dose thiazides and, in most but not all studies, with thiazide-like diuretics (chlorthalidone, indapamide) than with thiazide-type diuretics (hydrochlorothiazide). In post hoc analyses of subgroups of patients with hypertension and type 2 diabetes, thiazides resulted in a significant reduction in cardiovascular events, all-cause mortality, and hospitalization for heart failure compared to placebo and generally were shown to be non-inferior to other antihypertensive agents. Benefits attributed to thiazide diuretics in terms of cardiovascular event reduction outweigh the risk of worsening glucose control in type 2 diabetes and of new-onset diabetes in non-diabetic patients. 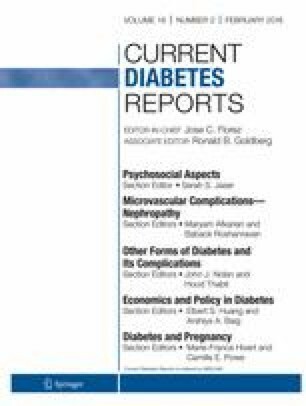 Thiazides still play a key role in the management of patients with type 2 diabetes and hypertension. No sources of funding were used to assist in the preparation of this manuscript. No conflicts of interest are directly relevant to the content of this manuscript. A.J. Scheen has received lecturer/scientific advisor/clinical investigator fees from AstraZeneca, Boehringer Ingelheim, Eli Lilly, Janssen, Merck Sharp & Dohme, NovoNordisk, Sanofi, and Servier.